Giant snowball rolls into downtown Cocoa Beach! Snow is in the forecast for downtown Cocoa Beach! The 2nd annual Winter Fest, organized by Cocoa Beach Main Street, takes place from 5 p.m. to 10 p.m. Dec. 2 on Minuteman Causeway in downtown Cocoa Beach. 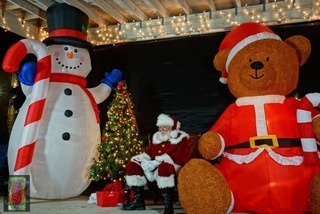 This year Cocoa Beach Winterfest features a host of family-friendly activities including holiday music, pictures with Santa, train rides, and fabulous food. This year’s event is sponsored by the City of Cocoa Beach Waste Management, the Cocoa Beach Hotel and Lodging Association. And of course the main attraction: Snow and a snow slide, right here in sunny downtown Cocoa Beach. Admission is free to the public. “There will be fun for everyone and families can kick off the holiday season with friends,” said Beth Javens, executive director of Cocoa Beach Main Street. Surfing Santas Dec. 24th 8 a.m. This annual tradition includes hundreds of surfers decked out in their best Santa gear. Where Minuteman Causeway meets beach. Free event. All surfers and spectators are welcome.